​FC Schalke 04 fans have travelled in numbers for their side's second leg of the Champions League last 16 clash with Manchester City at the Etihad. The German side are 3-2 down on aggregate after late goals from academy graduate Leroy Sane and Raheem Sterling rescued a dramatic victory for the 10-man Citizens. But that hasn't stopped ​Schalke fans from amassing in force for this second leg in England. As documented by Northern Quarter MCR on Twitter, the fans from Gelsenkirchen have taken over the Manchester streets, and were in raptuous voice ahead of kick off. And, in another video posted by Twitter user @ThompsonJordan_, the festivities then took to the roads, as fans congregated along two lanes of one road, bouncing up and down as they chanted next to three rows of stand-still traffic. Domenico Tadesco's side are currently sat in a lowly 14th place in the Bundesliga, 23 points off Borussia Monchengladbach in the fourth ​Champions League berth and 34 off Borussia Dortmund at the top. And, despite three harrowing defeats since that first leg - which includes a 3-0 loss at Mainz, a 4-0 home thrashing from Fortuna and a 4-2 defeat to Werder Bremen - leaving them just four points off the relegation zone, the fans have still found a way to come out in force for this second leg clash with ​City. Broadcasters BT Sport also picked up on the action, explaining in a post: "The Schalke fans have ARRIVED. 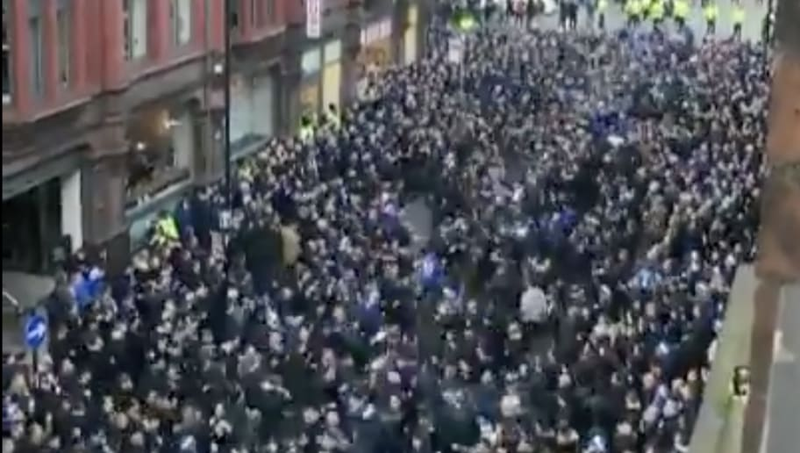 Incredible scenes as thousands of German fans make their way through Manchester's Northern Quarter."